Trellises, arches, arbors, and pergolas: These four garden structures are often confused. After all, each can be used to give your outdoor space privacy, shade, and filtered light, as well as serve as a support for climbing plants. Trellises are for Training vines, and they stand up straight like the letters ‘lli’ in the middle of the word ‘trellis’. Arches and Arbors are the two words that start with the letter ‘A’, and they both form an ‘A’ shape that you can walk under. Pergolas have four Posts, cover a Patio and often need to be installed byProfessionals. Can you tell that that the author of this article has been watching “Sesame Street” lately? Now that you have a general idea of which garden structure is which, you can decide which structure is appropriate for your garden. Let’s start with the trellis. A trellis is an easy and affordable addition because it’s really nothing more than a vertical screen on which plants can climb. You can make one from scratch, buy one from the hardware store, or pick up a tacky plastic one from a local big-box retailer. An iron trellis frames a water feature. Courtesy of Scott Cohen. 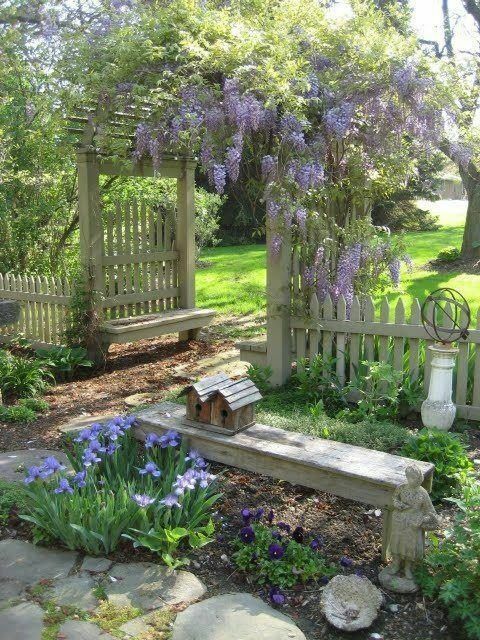 Use trellises to serve as focal points, disguise unsightly areas, and support climbing vegetables and flowers. Place multiple trellises side by side, or space them at regular intervals to create a garden wall. When choosing a trellis, take into consideration its ability to hold up under the weight of plants, heavy winds, and the ravages of time. Wood trellises are the most popular choice because they have a classic look, and are relatively affordable, readily available, and easy to replace. An arch is essentially a trellis that continues overhead to make — guess what? — an arch. Arches are more expensive than trellises and take more time to install, but they are worthwhile additions. Erect an arch to frame a view, or use it to mark the transition from one outdoor area to the next. Place one at the entrance to a vegetable garden, in an opening between hedges, or at the beginning of a path. Give visitors a reason to explore beyond the patio by constructing a freestanding arch that can be seen from a distance. Wisteria climbs up this beautiful arbor. Courtesy of Tony Leocadio. A close cousin to the arch is the arbor. Like arches, arbors are used to cover a path, provide a focal point, frame a view, or serve as an entry point to an area of the garden. Like arches, they usually have trellises to either side for climbing plants. Plant fragrant flowers or interesting climbing veggies and fruits at either side to create a tunnel of fragrance or hanging produce within easy reach. A really large arbor that covers an entire seating area, on the other hand, is considered a pergola. Pergolas require more time and money to build than their smaller counterparts, but they add lots of value. Usually, pergolas are supported by four big posts at each corner and topped with an open latticework. 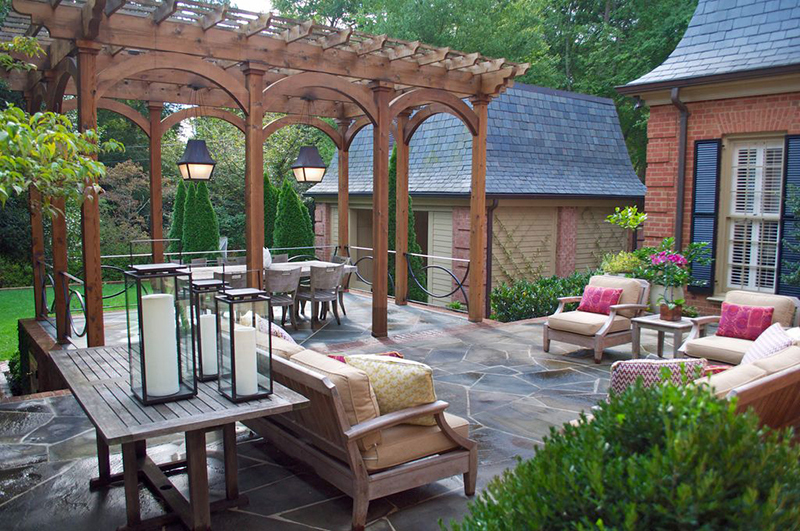 If you have the space, use pergolas to create a seating area away from the house. Most people, however, place pergolas against the house to cover a patio or deck. A freestanding pergola; note the trellises on the wall in the background. Courtesy of Bruce Clodfelter & Associates. The main disadvantage of a pergola versus a roof is that the open latticework leaves the seating area more exposed to the elements, but this could be to your advantage because filtered shade creates a more open feeling and lets more sunlight into the house. 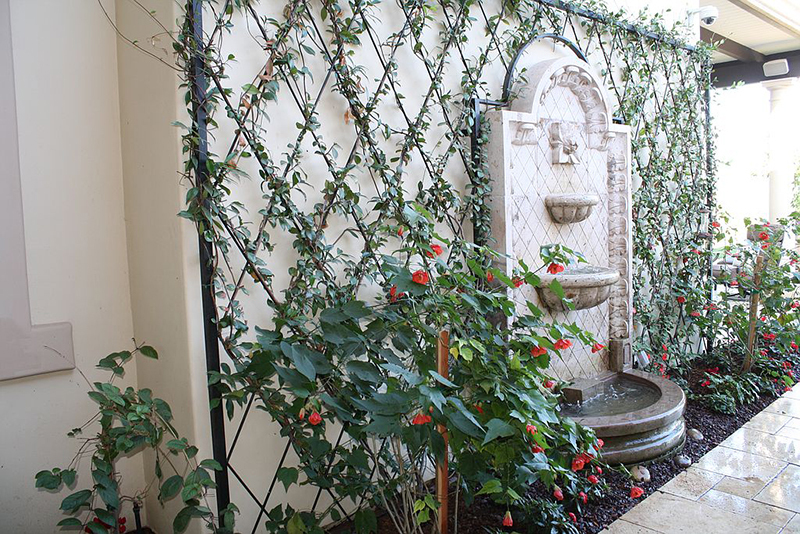 Pergolas usually do not have trellises attached, but are often still used as a support for wisteria, trumpet vines, hops, clematis, and bougainvillea. When choosing plants for your trellis, arbor, arch, or pergola, avoid those that will either outgrow their space, weigh down the structure, or make maintenance a nightmare. Also consider the attachment method for each plant. Avoid vines like Virginia creeper or ivy that attach directly to surfaces and can lead to rot. If you are choosing a weak-stemmed and rambling plant like a climbing rose or bougainvillea, help the stems attach by loosely tying them in place as they establish. To prevent rot and keep structures standing strong, choose a weather-resistant wood and sink the posts into concrete footings that slope downwards so moisture doesn’t collect. Trellises, arbors and arches can be a weekend job, but consider getting help for larger structures like pergolas. Remember, the letter P in Pergola is there to remind you toPossibly Ponder a Professional.